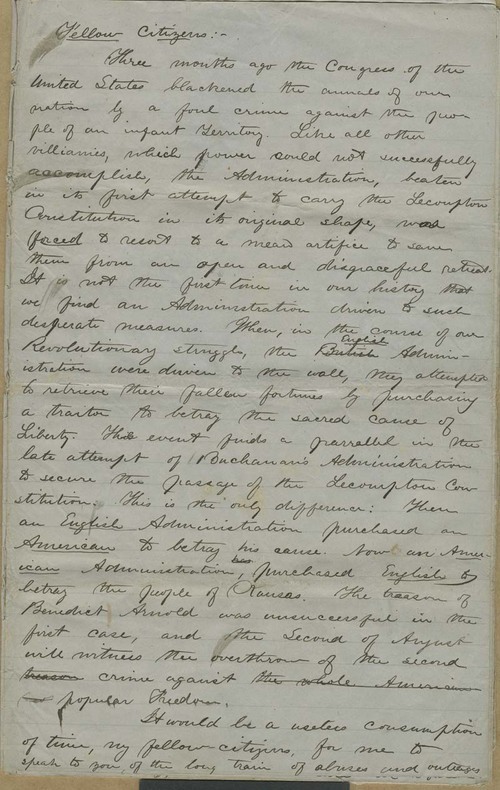 This hand-written speech appeared to be another by John Alexander Martin, seemingly composed for delivery in the spring and/or early summer of 1858, not long after he took over Atchison's Squatter Sovereign and renamed it Freedom's Champion. Here the speaker aimed his attack at the Buchanan administration and the English Bill, and the renewed attempt to pass the Lecompton Constitution at a referendum scheduled for August 2, 1858, and thus overturn the free-state victory that had already been won. The speaker seemed confident it would be defeated, as the constitution itself had been in January, but hoped for an overwhelming vote against (perhaps as many as 15,000).